Café Tortoni, also well-known as the Porteño café, where the locals of Buenos Aires drink their coffee or go for a typical Argentine Media-Luna. 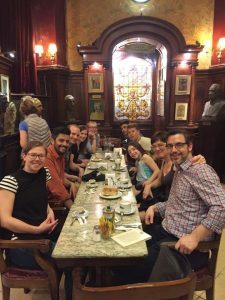 And since it is the oldest café of Buenos Aires it is very popular by tourists as well! The interior is amazing and… it has a lot more to offer! There are Tango Shows, events, you can buy souvenirs, drink coffee or maybe later in the evening an alcoholic beverage and the most important part… you can take the typical dishes of the Porteños. Just give it a shot! So today we went to the Café, we had quite a big group so that was fun. Our teacher told us during the short walk to the café a little more about the history. Interesting to know, because when we arrived at the café there was a line of people waiting to go inside. That must mean something! After waiting for 15 minutes we could go in with the whole group. My first impression.. wauw! The interior looked very old but it is very beautiful while the obers are dressed-up like the real obers in the past. Really cool to watch! The obers are amazing, it took a while until everyone had chosen something to drink or to eat as well. Anyways, the obers were friendly, patient and most of all they remembered everything of what the group ordered! I was impressed. What was more, the obers were really quick with bringing our “bebidas”. Additionally, our teacher recommended some typical things from this bar which was quite interesting. The so-called “submarine” sounded funny, it is served as hot chocolate but different. You get hot milk and a “submarine” from chocolate that you have to sink into the milk. Then you wait a little bit until you stir the chocolate through the milk. Further there were some delicious dishes like de typical Media-Lunas, Churros and Empanadas! Everyone enjoyed spending time to get to know each other since there arrived new students as well!